← What Do Millennials Want? A Baltimore grand jury has indicted all six police officers involved in the arrest and death of Freddie Gray, State’s Attorney Marilyn Mosby announced Thursday. The indictments come just under three weeks after Mosby filed multiple charges against each officer, finding that Gray’s spine was severely severed while in police custody after officers handcuffed and shackled the 25-year-old and placed him head-first into a police van without a seat belt. Gray died from his injuries a week later. 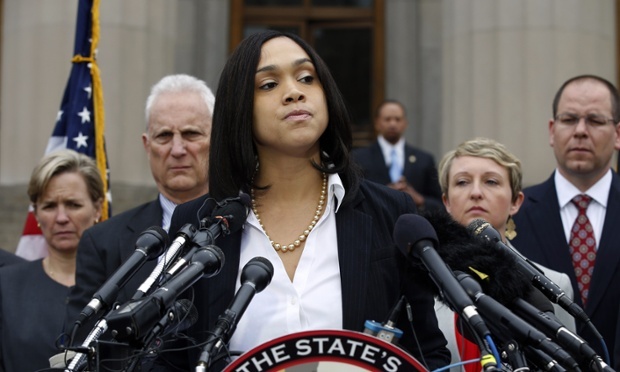 The charges brought by the grand jury vary only slightly from those Mosby announced on May 1. The most serious charge, second-degree depraved heart murder, remains against officer Caesar Goodson Jr., who was behind the wheel of the police van that transported Gray for 45 minutes. Read More 6 Baltimore police officers indicted in Freddie Gray’s death | MSNBC. This entry was posted in News from the Soul Brother and tagged Baltimore, Freddie Gray, indictment, justice, law, police abuse. Bookmark the permalink.